Students develop an understanding of a Culture of Peace and how it can be actioned. To understand a Culture of Peace, values, conflict sensitivity, happiness and wisdom. Students will gain an appreciation that they can make a difference to World Peace. The half day to full day workshop explores peace, cooperation, values, Gandhi, the dynamics and division of war, discrimination and division, conflict sensitivity, conflict resolution, ideas generation and wisdom. There is a short session on clowning to remind young people that we are here to be happy. The combination of these aspects of peace combine to help students understand the challenges of peace and how positivity can turn problems into challenges. They learn that we are all responsible for World Peace. The World Peace Day (WPD) in dedicated to the International Day of Peace 21 September 2012 but can be run at any time during the year. The WPD is designed to deliver workshops on peace, clowning and juggling. Schools are encouraged to have the children focus on peace activities such as poetry, posters and art works to creatively display their ideas on peace. 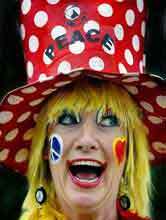 Peacefull the World Peace Clown will visit classes during the day to discuss peace. Schools have the option of providing a BBQ at the end of the day for parents to enable children to showcase their work. Ideal for all school levels: pre-school, primary, secondary or university. Children will develop a greater understanding of peace through the example of the peace clown and workshops designed to evoke a deeper understanding and experience of peace. Children and young people will discover that they can make a difference and contribute to peace in the World. The outcome for the school depends on the school contacting the media, organising the parents to attend an evening session which will develop relationships and highlight the proactive nature of schools recognising the importance of peace in ourselves and the community. The day will impact on children, staff, parents and the local community. Students will learn about the wisdom of the fool and that the real gold in life exists within them. Students will learn of the REAL HOPES values framework and how this applies to resilience in life and developing full potential. Learning the wisdom of the mythical fool’s journeys to discover in the metaphor of the real gold in life is to develop and live values. That is what makes people value-able. The Fool epitomises the philosophy ‘to thine own self be true’. Students will be able to discover their values to inspire REAL HOPES in their lives.